My thanks to the author for providing me with a digital review copy. No compensation was provided for this review, and all opinions are my own. A witty and sparkling romantic fantasy novella for adults that opens a brand-new series from the author of Kat, Incorrigible, Masks and Shadows and Congress of Secrets. 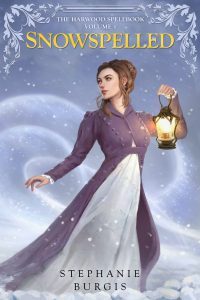 A fascinating world of magic and politics packed with charming characters and plenty of wit makes Stephanie Burgis’ novella SNOWSPELLED a delight for historical fantasy fans. Add a dash of romance and a pinch of sexual tension and it’s a winner for romance lovers too! It is a truth universally acknowledged that a young woman looking to avoid society – and one stubborn gentleman in particular – must be tricked into attending a week-long party in the country…with said gentleman in attendance. Several months after calling off their engagement, Cassandra Harwood wants nothing more than to avoid Mr. Wrexham – and the painful reminders of the time when she was still in possession of her magical abilities. But with Wrexham dogging her every step and a new acquaintance pestering her for information about being a female magician, a peaceful week in the country seems unlikely. Things go from decidedly uncomfortable to downright dangerous when Cassandra, desperate to escape the house party, stumbles into a trap set by a devious elven lord. If Cassandra can’t figure out the cause of the unnatural snowfall plaguing Anglia, she’ll be forfeit…and so will the peace between humans and elves. In the span of less than 200 pages, Burgis has built a complex and nuanced world run by politicians and magicians. Everyone in Anglia knows that only women have the cool tempers and sound reasoning required to run the country, so Cassandra’s refusal to join the Boudiccate and pursuit of the flighty and whimsical – and male – art of magic was a scandal of epic proportions. But through determination, talent, and a fierce competitive streak, Cassandra graduated from the Great Library with top honours and proved to all of society that a woman can work magic just as well as a man. This gender-swapped version of Regency England was a ton of fun to read about and I loved the apologetically feminist angle Burgis took – especially since she incorporates significant PoC and queer characters. As an great fantasy of manners should, SNOWSPELLED features a swoon worthy, subtly tension-filled romance. While it’s true that Cassandra and Wrexham are no longer betrothed, there’s no question that they’re still in love…despite Cassandra’s protests to the contrary. In the background of all the action, Cassandra’s brother Jonathan and sister-in-law Amy are doing their best to reunite the pair, often with hilarious results. I found myself nodding along with their arguments and imprecations – Cassandra and Wrexham clearly belong together! As annoyed as Cassandra might be by their antics, she’s going to need their help – and Wrexham’s – to put things to rights and save the alliance between humanity and the elves. I was pleasantly surprised by the direction SNOWSPELLED took in the end, and now I’m dying to read the sequel! Highly recommended. Have you read any memorable stories that feature a gender-swapped element? What do you think of historical fantasy? Let me know in the comments! Sounds great! I like seeing more fantasy novellas, and unnatural snowfalls? Elves and a gender swapped Regency England? Yeah sounds like a blast. And the matchmaking relatives sounds like a fun, humorous angle. I love that line “It is a truth universally acknowledged…” Nice! I know some people aren’t too keen on them, but I love a good fantasy novella! There’s something very impressive about an author who can put a novel’s worth of world building and character development into a third of the pages. Burgis did a great job with this one — it’s clever, creative, and fun! I really love P&P and I love the angle on this fantasy. I’m definitely hoping to come across this soon. Hooray! My evil plan continues to prove successful, haha. This has such strong P&P vibes, but with a lot more diversity, feminism, and of course magic. 😉 Thanks so much, Di! I’m a big fan of Burgis, and I’ve seen nothing but awesome reviews for this book. One of these days I’ll have to try to fit it in! Umm hello! This sounds AMAZING and I desperately need it in my life. I’m here for all the politics and action, and of course, you completely won me over with the promise of a swoon-worthy romance, and a couple that secondary characters in the book are trying to pair up. It’s not easy to pack a lot within a novella and sounds like Burgis’s book is an exception to that. IT IS AMAZING!!! I was saying to someone else that it reminds me a lot of a Julia Quinn story, but with more diversity and epic world building. Who wouldn’t have fun reading that, right? 😀 Stephanie Burgis is one to watch — each book I’ve read by her has impressed me more than the last! I’m not the biggest fan of the cover, however the story sounds pretty interesting and charming. I might give it a chance in the future. Charming is a great way to describe this one! It kind of reminds me of a Julia Quinn novel with magic, so if you enjoy her then you’d love the story. I need that coat…like today! Me too, major outfit goals! Ooh, sounds cool. Gender-swapping fantasy is one of my favs. I remember a long time ago, I read through Fate/Stay Night (a visual novel), which has a pretty neat mix of gender-swapped classic myths incorporated into an urban fantasy setting. Me too, I love a good gender-swapped story! I don’t think I’ve heard of Fate/Stay Night before, but the combination of urban fantasy plus gender-swapping is definitely something I should be reading. It sounds epic! This was so good wasn’t it – I didn’t know there was a sequel – I hope there was and now you’ve confirmed it so yay. That is such a pretty cover (and coat thing that she is wearing)! It sounds like the author managed to do a lot with a fairly small amount of pages. And how cool that it’s a gender-swapped version of the past! I don’t think I’ve read anything like that. I have to say this is the first gender-swapped sort of element like this I’ve read. It’s so great to see — and to see the author accomplish it all so wonderfully. Yours is the second positive, glowing review of this book, and well-deserved from what I can see! It’s one of the only ones I’ve read too, and I absolutely loved how Burgis incorporated those aspects into the story and the world building. I highly recommend this one if you’re looking to try her work out! I was already a Burgis fan but after reading this one I’m a devotee, hahaha. It really charmed me. YES! I loved that parlour scene, too. I also really liked all the sly commentary on women “ruining” a man by being alone with them. I’m so excited to see what Cassandra, Wrexham, and the others get up to next! Erm, how have I not read this? How have I note even heard of it before? I am off to browse the interwebs and try and get the best price on this because your review made me make grabby hands at my screen. It sounds so good! And the romance sounds good. The world itself sounds totally awesome. I mean, this sounds like a book that has both romance and story and does both well. This never happens! I really do not know! Hahaha. Snowspelled is SO GOOD and it’s completely up your alley, too. It reminded me of all the best parts of a Julia Quinn novel meets fantasy, so what’s not to love? Stephanie Burgis is killing the game lately and I cannot wait to see what else she comes up with! That should have been your review summary, just that sentence ‘all the best parts of a Julia Quinn novel meets fantasy’. That would have sold me instantly. This looks like another historical fantasy that will be right up my reading alley! You seem to be having a good reading year particularly in this sub-genre!